At the moment my children are obsessed with toy catalogues. They can look at them for hours. Much as I like the fact that they are occupied with turning pages rather than flicking channels, I do worry that this isn't a wholly healthy activity. "I want this, and this, and this, and this…" does irritate me after a while! 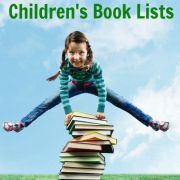 So recently I decided to turn this obsession into a more positive activity, by suggesting to my children, "Why don't you make your own books all about the best toys you can find in the catalogues". So the idea of mini toy books was born. The boys cut out pictures of their favourite toys from the toy catalogues and stuck them in their home-made books. Beside each picture they wrote information about the toys such as the name of the toy, description, reference number, suitable age range and price. They loved it! My 6 year old couldn't get enough of it and is already on his third book. My 4 year old enjoyed cutting out the pictures of the toys and sticking them into his toy book and he wrote a few titles and prices. 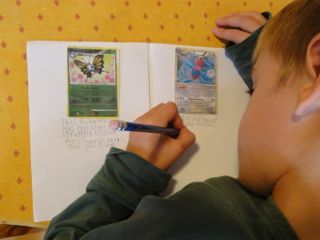 His brother helped him out with the rest of the writing. 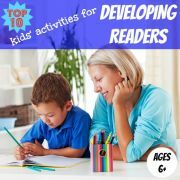 Ask your child to read the descriptions of the toys already provided in the catalogue and extract the essential details they want to include in their own toy book. Or, of course, they can just make up their own descriptions if they prefer, as mine did. Talk to your child about the 'salesman' style of language used in the toy catalogue and see if they can replicate this in their toy descriptions. 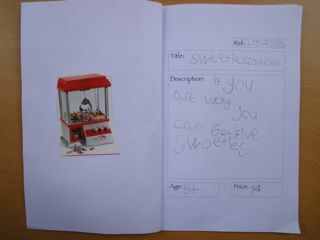 This might encourage them to use more varied vocabulary when describing the toys. I was surprised by how easily my son took to it. Practice writing numbers using the reference numbers and prices. 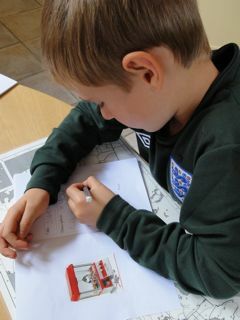 My eldest son is still at the stage when he inverts some numbers, so the more practice he can get at this, the better. Propose some simple sums for older children, such as how many of the toys in their catalogue they could buy with 50 dollars/euros/pounds. So why not have a go and make your own books too. Keep reading to find out how we did it. Gather your materials. 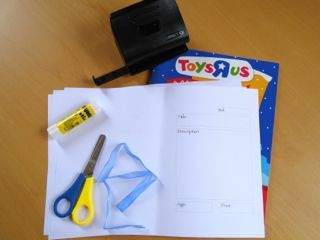 To make your own books you need paper, scissors, glue, a hole punch, ribbon (or something similar to bind the book together) and some toy catalogues. I used four pieces of paper for the book which, when folded, allows your child to describe seven different toys. On the right-hand side of each piece of paper draw boxes for the Reference number, Title, Description, Age and Price. Leave the left-hand side of the paper blank since this is where your child will stick the picture of the toy. Click here to download the template I used. For three of the four pieces of paper, turn them over and draw the boxes on the back of the sheet of paper too (also on the right-hand side of the sheet). 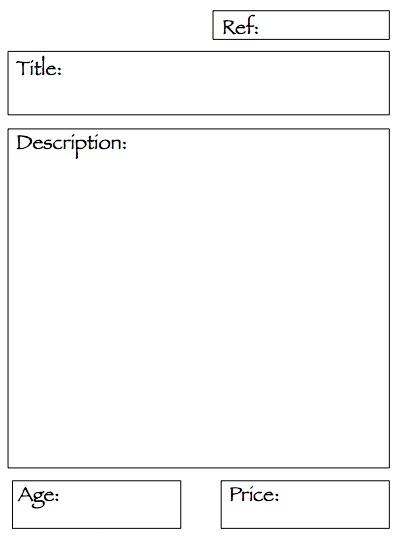 Or, if you are using the template, print this on the back of three of the pieces of paper. 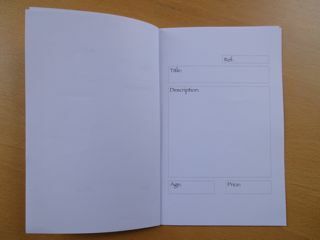 The fourth piece of paper will be the cover so one side can be left blank, for your child's own cover design. Stack the four pieces of paper in a pile, with the cover sheet at the bottom of the pile, blank side facing the floor. 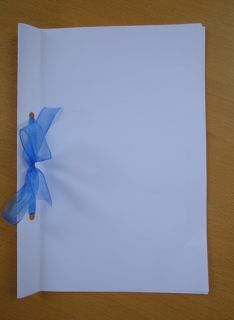 Fold the sheets in half, punch holes in the folded side, thread the ribbon through the holes and tie the ribbon tightly. Make a second fold parallel to the spine of the book but to the right of the holes, so that the pages turn more easily. Voila! You will see that as you turn each page there is always a blank sheet on the left, and a description sheet on the right. 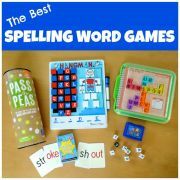 Set your children off - cutting, pasting and writing. 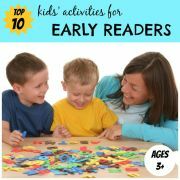 Ask them to look through the toy catalogues and choose a toy they like. They should cut out the picture of the toy and stick it on the blank left-hand side of the page. Then ask your child to write about the toy in the boxes on the right. Finally, they can decorate the front cover (and back) as they like. 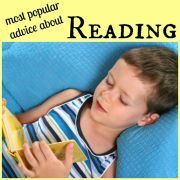 Of course, you could make your own books on any subject close to your child's heart using this method. What about one on animals, pretty outfits, vehicles or superheroes. Just adapt the titles of the information boxes to something relevant to the subject and seek out a good source of pictures to cut up. National Geographic magazines would be perfect for a book on animals. 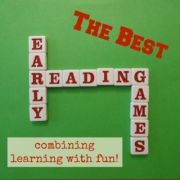 You can find more ways to make your own books here.